I have started, and stopped and started, and deleted, and started and deleted and started again, on this write up of Stamped from the Beginning by Ibram X. Kendi at least half a dozen times. There’s some part of me that feels like a ‘review’ is inappropriate, at least based on the actual content itself. I do have some readability notes to share a little later on, but as for what is written, I’ve just been kind of stumped. I cannot dispute the claims Kendi makes, and I didn’t dive in and investigate all of the many referenced material. However, as I suspect would be the case for many white people with a standard public school education reading this, I did hear a kind of argumentative, or even at times incredulous voice in one ear, as I pondered what was being said in the other. I chose to pick up and read this book after a conversation on Facebook backed me into an intellectual corner. I like to speak and know what I’m talking about. I don’t recall what the conversation was about, but it was surely related to the political atmosphere in the united states right now: Trump, racism, bigotry. Being unable to defend my beliefs in this instance lead me to search out something that would help me understand what is actually happening in the cultures of America, and what better way to do that than to read history. I am a little embarrassed to admit that my knowledge of American history has not been great. I know the major pieces, but all the nuance has previously just been pieced together from various places; high school textbooks I barely read, tv, movies, casual conversations, and so on. But, it doesn’t take a genius to simply guess that those sources of information are going to make some serious omissions. And I did, and they did. American history is black history, just as much as it’s European history. This was my belief, taken on some kind of faith before reading Kendi’s book, now it’s knowledge. The average member of the dominant people group in our nation, simply going about their business, is perhaps expected to think all the important stuff involved the white people. But it didn’t, and in fact, an awful lot of the ‘important’ stuff (good or bad) that white people did was typically to, or to a much lesser extend, for black people. We don’t think about that much, and for good reason: centuries of overt and cleverly disguised strategies by the rich, white and powerful to make sure we don’t. The first thing that struck me in this book (and probably the most lasting impression it will leave on me), is the ‘lifecycle’ of racism. Americans tend to think of racism as something born of hatred, which leads to hateful public policies, and racist actions. But, Kendi promptly turns this on its head. Rational self interest leads to racist ideas, which leads to racist policies and actions. In fact, the very concept of racism was born out of white European’s needs to justify their dehumanizing slave trade. They were doing a thing that offended their moral principles, and they invented racism to square it away. That never went away. It didn’t even skip a beat. From someone who doesn’t want their daughter dating a black person, and so pays special attention to black criminals in the news, to a racist CEO who makes sure their employment application strongly favors white people, racism has embedded—even merged—itself with the very identity of a majority of white Americans. In addition to turning the nature of racism on its head, Kendi had another profound revelation for me. Racism is not binary, it’s a spectrum. In the past few years, I have struggled with much of the discussion about racism. The language we hear regularly these days regarding race and racism, if heard through this binary lens, becomes problematic. “Uncle Joe” for example, is not a racist like members of the KKK, or white nationalists are racist. But, it wouldn’t exactly be right to say he’s not racist either. Uncle Joe is on the racist spectrum—as virtually everyone else on the planet today is. Understanding this, I believe, is critical for the sake of productive conversation, empathy and progress. In the binary world of racism, Uncle Joe cannot change. It would be like a bird changing his feathers. But when Uncle Joe is simply on that spectrum, he needn’t take a claim of ‘racism’ as an insult to the core of his humanity, but rather a critique: a need to work his way from the racist end of that spectrum, to the anti-racist end of that spectrum. Understanding this has already lead me to more productive conversations with people who are still blissfully (or even indignantly) unaware. A lofty goal of every human being should be to root out, acknowledge and let die, every vestige of racism they unknowingly harbor. Human beings are complicated creatures, and we exist both as individuals, and as a corporate body. Any solution to the dysfunctions a people experience must respect our complications at both the individual and the corporate level. For me, the affirmation of this reality was a huge step foreword, both internally and externally. As for the history of racism in America, this book was extremely long and dense. Reading it through from beginning to end, being provided a narrative to understand and track along with, I was jaw dropped. It is heartbreaking, and angering. But as a white person, the really interesting thing is that it didn’t even once illicit a head scratching “what were they thinking?!”. Instead, it was rather clear, and very uncomfortably familiar. Reading through the chapters, one finds accounts of argument after argument in favor of racism that are still being used in some form today. American racism has changed clothes a few times, but it is fundamentally the same as it was from the start, existing in an unbroken string since before the United States was even a nation. We once had slavery, now we have laws that disproportionately target people of color, forcing them into jails where they work for slave wages. At one time black people were not allowed to vote because they were black, now we have laws that prevent people with criminal records or without ID’s from voting. It used to be that a lynch mob could kill a black person with impunity for simply looking at a white person the wrong way—now the cops do it because their tail light is out and they’re “afraid”. We could keep going with this. Throughout history, white people (the dominant people group in America) have been given every benefit of the doubt, while black people have, at best, gotten an ‘exception’. This was true from the first black intellectuals in the country, the “extraordinary negros”. And it continues, though with more subtly, to this day. Just watch the news—black criminals were “thugs”, and white criminals were “very promising individuals”. Within our culture, an “excellent” black person is some kind of exception from “their kind”, while a degenerate white person is an exception from theirs. Getting black people to “act like” white people, look like white people, mimic white culture, did not dispel racism. Educating white and black people did not end racism. Segregating black and white people did not eliminate racism. “If they just…” arguments all essentially end the same way: racism is black people’s fault. It’s not, and never has been. That is not to say that all black people throughout history have been entirely blameless for whatever condition befell them, and it’s not to say that every white person throughout history is entirely to blame. But it is to say that black people cannot solve racism all by themselves, even if someone that entire people group actually did homogeneously follow every prescription handed to them by white people. The one black man who rapes a white women will still be the emblem of their whole race in the eyes of the racists, and the richest, most successful white person will still be the emblem of white people. In the final chapter, and epilogue, Kendi ties a lot of ends together and makes something profoundly clear. Racism is, and always has been, the tool of the rich and powerful to maintain their power and wealth. It’s more nuanced and subtle than it used to be, but it’s still absolutely true. It was used to bolster the ego of poor white people during slavery. It was used to create a kind of ‘caste’ system after slavery. It was used to invent and segregate a white middle class after the Great Depression. And, it’s being used today to keep the average American, who is one of many colors and genders, from voting for their own interests. If racism is eliminated, many White people in the top economic and political brackets fear that it would eliminate one of the most effective tools they have at their disposal to conquer and control and exploit not only non-Whites, but also both low-income and middle-income white people. Power will never self-sacrifice away from its self-interest. Power cannot be persuaded away from its self-interest. Power cannot be educated away from its self-interest. Those who have the power to abolish racial discrimination have not done so thus far, and they will never be persuaded or educated to do so as long as racism benefits them in some way. To undermine racial discrimination, Americans must focus their efforts on those who have the power to undermine racial discrimination. Kendi makes an important remark toward the very end. He points out that racism is quantifiably bad for everyone, except the rich and powerful, who use it to maintain their wealth and power. “It’s not good enough to be non-racist. We have to be anti-racist.” We have to stand up to racist policy and racist ideas, even if it doesn’t appear to affect us directly and even if it appears like we might even benefit from it. We won’t, at the very least, not in the long run. The policy you think will make your job “safe”, but dehumanizes migrant workers in the process, is also probably the policy that dubiously pads the richest American’s pockets and makes it harder to hold them accountable for it. Just wait until they use that power to cut costs by firing you and sending your job to a place where they can pay someone slave wages. Rinse, repeat. 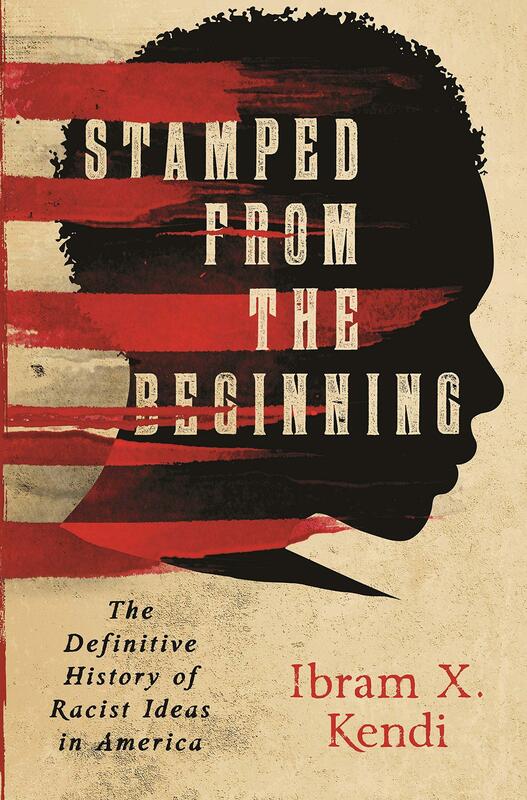 Stamped from the Beginning was a very long, very dense book. It was emotionally and intellectually challenging. As a reader, I found myself wishing Kendi had split the chapters up a bit more, making it a little easier to read. But, it’s also engrossing and somewhat difficult to put down, so perhaps that’s okay. I can’t recommend this book more highly—every American, especially white Americans, should read this book. But, unfortunately, that doesn’t seem realistic. It’s just a hard read, and honestly, I don’t know too many people with the fortitude to face the challenge. If you’re one of those people, don’t slink away. Go find an audiobook version and intake the information that way. Think on it. Consider it. Wrestle with yourself as your mind throws up objections. The fact of the matter is this book, like every historical account of anything, is not a complete or perfect or unbiased perspective. But black history in America is incredibly important to understanding what is happening today. And it’s incredibly important to understanding our own personal identity, whatever that may be. Every form of racism, bigotry and discrimination that has been used to shepherd unknowing people into hatred and division has taken a play from the white racist playbook. They are deeply interconnected, and racism against black people is the common thread from which they all fray. Read this book, and then read some more.